PITTSBURGH, Pa. — Starting yesterday, visitors of the new August Wilson Center for African American Culture were treated to an exciting interactive art installation projected onto several first-floor windows. 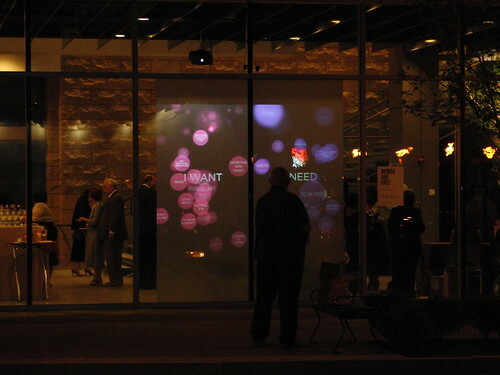 The installation allows visitors to text message their wants and needs onto a video projection, and vote for existing wants and needs as well. Steelicon Valley provided the interactive development expertise, including a custom motion detection system that allows observers to bounce orbs around the scene. Steelicon Valley is a software development, advertising, and communications company located in Pittsburgh, Pennsylvania. Steelicon Valley specializes in integrating new technologies into a client’s existing brand and business model. It is owned and operated by veterans of the advertising, information technology, and multimedia industries.You may visit the Steelicon Valley website at: www.SteeliconValley.com. You may contact lead developer Chris Natale at 724-713-2130. The August Wilson Center for African American Culture is a not-for-profit organization that presents performing, visual, and educational programs at 980 Liberty Avenue in Pittsburgh’s Cultural District.. You visit the Aust Wilson Center website at www.AugustWilsonCenter.org. PITTSBURGH, Pa. — We always like it when good work gets noticed, and are pleased to report that Defender of Sling City has received Android App Review Source’s Highest Seal of Approval rating. PITTSBURGH, Pa. — Steelicon Valley is joining other local technology companies to develop an exciting interactive art installation to celebrate the opening of the August Wilson Center on September 17 in Pittsburgh’s Cultural District. The installation will also be available for leaders of the most advanced economies of the world to experience when Pittsburgh hosts the G20 the following week. Visitors walking by the August Wilson Center will see a series of words contained in floating orbs projected on two of the building’s windows. Words on the left will represent WANTS, while words on the right represent NEEDS. To add a want or need to the installation, visitors will send a text message to a specific number, which will cause an orb to appear. WANTS or NEEDS that receive multiple text requests will become larger floating bubbles. The installation will provide striking aesthetics in keeping with the rest of the soon-to-be-opened building, located at 980 Liberty Avenue in Pittsburgh’s Cultural District. The level of interactivity available to passers-by allows visitors and local residents alike an ability to shape the exhibit. Players use the touchscreen to launch rocks at the invading enemy. PITTSBURGH, Pa. — Steelicon Valley has launched Defender of Sling City, an exciting new game for the Google Android operating system. Defender of Sling City is available for purchase on the Google Android Market.